MENDOTA HEIGHTS, Minn. – The Gustavus women’s hockey traveled to St Thomas on Friday night and fell 3-1. With the loss the Gusties move to 8-4-1 overall and 5-2-0 in MIAC play while the Tommies move to 13-0-0 overall and 7-0-0 in conference. The Gusties fell behind early in the first period when St. Thomas converted on a power play at the 9:59 mark of the first period. The Gusties were able to answer a few minutes later when Amelia Vosen (Jr., Nowthen, Minn.) found the back of the net with assists going to Kristina Press (Fy., Cottage Grove, Minn.) and Allie Stanger (Sr., Paynesville, Minn.). Gustavus couldn’t hold the tie going into the the break though as St. Thomas scored at the 16:48 mark to take a 2-1 lead going into first intermission. The Tommies started the second period the same way they ended the first by scoring just 2:06 into the period to take a two goal lead. 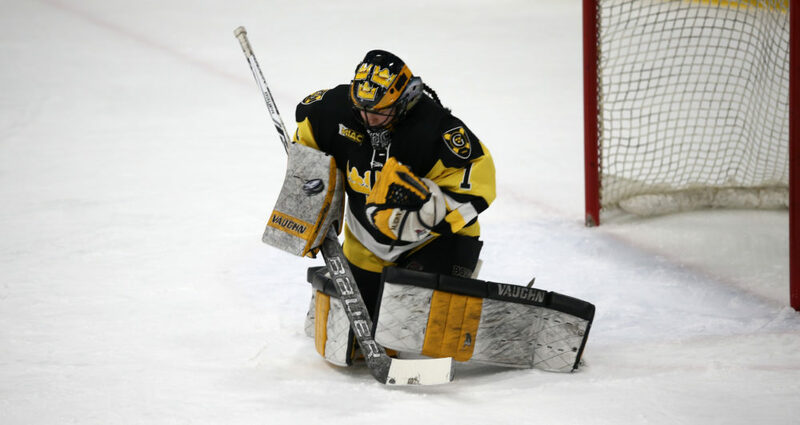 Although the Gusties outshot St. Thomas in the final two periods 15-6, they weren’t able to muster a goal as Mackenzie Torpy successfully made 20 saves in the contest while allowing just the one goal. The two teams will meet up for game two of series tomorrow afternoon at 2 p.m. at Don Roberts Ice Arena in Saint Peter.